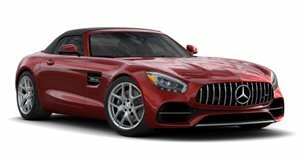 Mercedes has offered the AMG GT in a wide, almost Porsche-like array of configurations: coupe and convertible, in base, S, C, and R specs. If you wanted the top GT R in convertible form, you were left out in the cold... but that changes today with the introduction of what could be the best version yet of the Silver Star sports car. Bowing this week at the Geneva Motor Show, the new Mercedes-AMG GT R Roadster packs Affalterbach's 4.0-liter twin-turbo V8 in front of its open cockpit, tuned to deliver 577 horsepower and 516 lb-ft of torque. The power is transmitted to the rear wheels through seven speeds and a dual-clutch transmission. Top up or down, it'll scurry to 60 in 3.5 seconds and keep pulling until it's blurring the scenery at 197 mph. Those are the salient details, but there's much more for performance geeks to delve into. Like the enhanced, dynamic aerodynamics package that reduces front-end lift by 88 percent at 155 mph. Or the tracks that have been widened by 1.8 inches at the front and 2.2 at the back compared to previous, "lesser” versions of the AMG GT Roadster. Ten-spoke alloys measure 19 inches at the front and 20 at the back, wearing ultra-grippy Michelin Pilot Sport Cup 2 rubber. They house brake rotors measuring inches 15.3 (front) and 14.2 (rear), with available carbon-ceramic discs (upgraded to 15.8 inches at the front), gripped by yellow calipers. A carbon-fiber torque tube is 40 percent lighter than the aluminum version, and carbon-fiber tunnel and front-end braces increase torsional rigidity while saving weight over their respective aluminum and steel versions. The cylinders even feature a special boating to decrease friction and ware in what's arguably the most desirable performance machine Daimler offers. The GT R's suspension has been recalibrated for the open-top model. Rear-wheel steering helps with maneuverability at low speeds and directional stability at highway pace. And there's more electronic goodies on board than a Best Buy store: like the adaptive dampers, the nine-mode traction control, and speed-sensitive steering. Even the 12.3-inch instrument (separate from the 10.25-inch infotainment) screen can be switched between three display modes ahead of the AMG Performance seats upholstered in diamond-stitched Nappa leather with a combination of carbon and piano-lacquer trim. And the cabin's topped by a three-layer fabric roof on a frame of steel, aluminum, and magnesium. There's a special shade of matte gray reserved for the GT R Roadster (in addition to the standard choices), and additional carbon-fiber packages available as well. The only downside here is that Mercedes will only make 750 examples for global consumption. 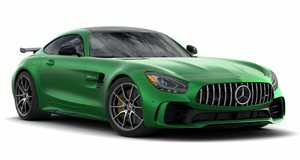 And while we don't have pricing and availability info just yet, you can bet it'll command a premium over the $158,850 that Mercedes charges for the AMG GT C Roadster or the $159,350 it gets for the GT R coupe.